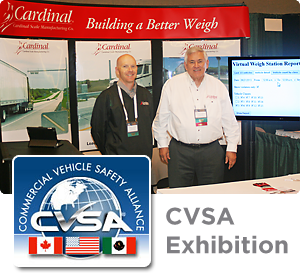 Weigh-in-Motion Highway Systems from Cardinal Scale Manufacturing Co.
Cardinal Scale Manufacturing Co. will be exhibiting the company’s latest weigh-in-motion highway system products at the 2017 Commercial Vehicle Safety Alliance (CVSA) Annual Conference & Exhibition September 17-21, 2017 held in Whitehorse, Yukon, Canada. Please come by Cardinal Scale’s booth to visit with us and meet some of our staff. Weigh-In-Motion (WIM) vehicle scales offer a cost-effective means of measuring truck axle and gross weights without affecting the flow of traffic. WIM scales are routinely used in commercial weight enforcement to screen trucks entering a weigh station returning legally loaded vehicles back to the main roadway while directing over weight trucks to the static scales. In-motion scales are also used in Virtual Weigh Station applications to monitor traffic identifying those vehicles with weight violations and sending their image and weight information wirelessly to an officer located downstream of the scale site. Still other in-motion vehicle scales are used to weigh bulk commodities where real time information on the flow of material is required. Cardinal Scale offers a full line of in-motion vehicle scales utilizing strain gauge load cell, piezoelectric, and Kistler LINEAS® technologies. These scales meet or exceed ASTM E1318-02 performance requirements and can be used with a variety of peripherals like over-height detectors, off-scale sensors, image capture cameras, DOT and ALPR readers and others. Custom software allows the WIM-based system to fit your exact requirements while modular hardware design ensures the ability to upgrade in the future. Cardinal Scale’s team of ITS professionals are ready to help you with your next project.